Since the moon is only visible because of light reflected from the sun, there is a fairly obvious relationship between lunar-solar elongation and lunar phase--see Fig. 26. For instance, a new moon corresponds to , a quarter moon to or , and a full moon to . New moons and full moons are collectively known as lunar-solar syzygies. 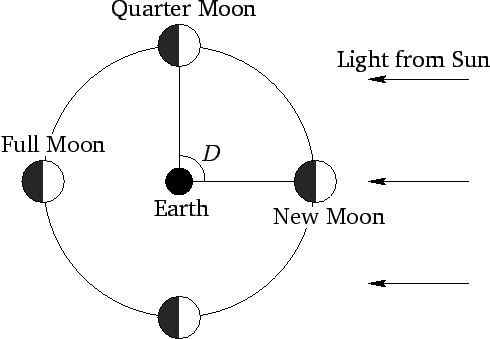 Figure 26: The phases of the moon.